Australia can only be protected from new plant pests with cooperation between plant industries and governments. PHA has played a key role fostering effective partnerships since the company’s inception in 2000, and company membership continues to increase, broadening PHA’s reach. Under the new strategic plan, PHA will continue to bring partners together to work collaboratively to strengthen Australia’s biosecurity system. New members will be fostered, particularly new industries and new associate members – stakeholder organisations with roles to play in plant biosecurity. PHA will work to extend relationships further along the value chain and plans to enhance the reputation of the company and the plant biosecurity system internationally. PHA’s important role as a promoter of the importance of plant biosecurity will also be strengthened with more resourcing for the Farm Biosecurity Program and other awareness-raising initiatives. As custodian of the Emergency Plant Pest Response Deed (EPPRD) PHA has a leadership role in eradication responses to serious new pest incursions. The EPPRD provides post-border protection for Australia’s plant industries and associated rural communities, the environment and the national economy. PHA will provide guidance to Parties to the EPPRD to ensure effective operation, as well as continually evaluating and improving the agreement to ensure that it keeps pace with the needs of signatories. Parties to the agreement will be assisted to increase their emergency response capacity. Given the importance of picking up new pest incursions quickly, and the need to demonstrate area freedom, PHA will take leadership in developing systems of surveillance for high priority pests within Australia. PHA will assist industries to expand data collection for key exotic pests, work to establish farm or regional surveillance systems and, through government-industry partnerships, work to implement biosecurity plans. To maximise benefits from improved systems of checking for pests, PHA will invest in data management and reporting systems, with ongoing benefits to market access for Australian produce. Accurate and rapid identification of pests is a fundamental element of the plant biosecurity system. PHA will continue to boost Australia’s diagnostic capability by building a coordinated network of experts that provides comprehensive coverage of expertise nationally. Efforts to increase diagnostic preparedness for priority plant pests will continue through improving the skills and knowledge of diagnosticians, as well as facilitating the development of protocols for the identification of key exotic pests. PHA will assist stakeholders to find solutions to a wide range of nationally significant biosecurity issues where no existing framework applies, such as weeds, national fruit fly management, newly introduced pests and pests of pastures. The company will do this by developing strategies, facilitating partnership approaches and managing large-scale programs. Through partnerships, PHA will also take the lead in identifying initiatives to improve preparedness including plant biosecurity research, development and extension. 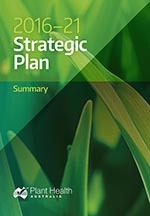 The work will inform the development of future strategic frameworks. Preparedness initiatives include managing programs for newly introduced pests such as national management plans, and facilitating industry-government partnerships that boost biosecurity planning for industries and contingency planning for high priority pests. With change pending in the structure of plant biosecurity science in Australia, PHA will increase its focus on coordinating RD&E across universities and other research organisations. This includes implementing the Plant Biosecurity RD&E Strategy, identifying areas of greatest need, identifying opportunities for cross-sectoral benefits and assisting in obtaining funding for needed research. With effective and transparent systems of governance, financial control and risk management PHA maintains a sound business. The company is committed to maintaining a highly skilled staff with a broad expertise base to assist members with their growing biosecurity needs.